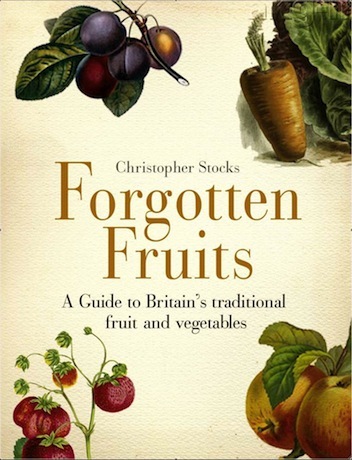 Forgotten Fruits, my first book, was published in hardback in 2008, followed by a paperback edition in 2009. Monty Don chose it as his book of the year, and it was shortlisted for both the André Simon and Guild of Food Writers awards. Britain has an extraordinarily rich heritage of traditional varieties of fruit and vegetables, but how many of us know the fascinating and sometimes eccentric stories behind them? Who was the Mr Cox, for example, who gave his name to Cox’s Orange Pippin, now the most popular apple in the world? Which conference were Conference pears named after? Where do Victoria plums really come from? What is so mysterious about the apple called the Bascombe Mystery? What role did beetroot play in ending the slave trade, and how did gooseberries help Charles Darwin arrive at his theory of evolution? Who started the uniquely British love-affair with rhubarb and runner beans? When and where was growing potatoes illegal? And could the Spanish Inquisition have been responsible for our carrots being orange? Forgotten Fruits is the first book to answer all these questions, bringing together the history of Britain’s fruit and vegetables, from their origins – some of them ancient, but others surprisingly new – to their influence, over the years, on British society, the changing attitudes towards the food we eat and, more recently, the reasons for their disappearance from our supermarket shelves. Informative, entertaining and packed with intriguing insights into the past, Forgotten Fruits offers an entirely new way of looking at the history of British cooking, gardening and society. In it you will find onions named after islands, a tomato named after a yacht, an unknown variety of redcurrant discovered growing under a gooseberry bush, new kinds of apples found in gutters and on rubbish tips, even a parsnip named after a popular song. You can buy a copy of Forgotten Fruits here. I’m currently working on Pebbles, a new book with the illustrator Angie Lewin, to be published by St Jude’s in their Random Spectacular series.